Embark on a Journey to the 1880’s and experience Great Lakes Maritime History and a unique dining experience at a lighthouse built in 1857. 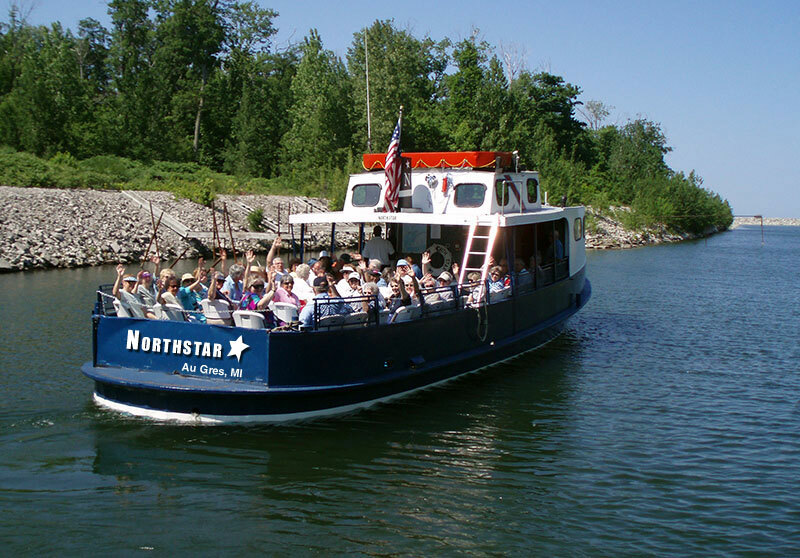 Our cruise begins with a leisurely one hour boat ride across Saginaw Bay, Lake Huron to Charity Island with appetizers and complementary soft drinks and bottled water. (Guests may bring their own adult beverage along to enjoy on the boat – but they must be left on the boat). Once we arrive at Charity Island Marina it’s a short walk through a beautiful forest to the Lighthouse, where you’ll enjoy Island history stories, followed by dinner. After dinner and tours of the Home, you can visit the gift shop or relax in a rocking chair on the porch of the light-keepers home and enjoy the quiet Island ambiance. Our return trip will be timed to catch the sunset half way back to the mainland. Price is $94 per person, choice of fresh lake perch or beef tips. We serve MI red skin potatoes, cooked cabbage salad and fresh baked bread. Coffee & cheesecake served on trip back to dock. Boat leaves Caseville Municipal Harbor (Directions to Caseville Municipal Harbor Caseville, MI).